Coconut trees are grown in tropical countries mainly for the high oil content of the endosperm (copra), which is widely used in both food and non-food industries (e.g. margarine and soaps). Large production areas, in particular, are found along the coastal regions in the wet tropical areas of Asia in the Philippines, Indonesia, India, Sri Lanka and Malaysia. (See Table 1). In these countries millions of people make a living from the coconut palm and its many products. Total world productivity has increased substantially from 35 million tonnes around 1980 to almost 50 million tonnes today. Yield varies from region to region (3 500 to 6 000 nuts/ha/year), which is due to a number of factors. One tree may yield on average 70-100 nuts to a maximum of 150 nuts per year. 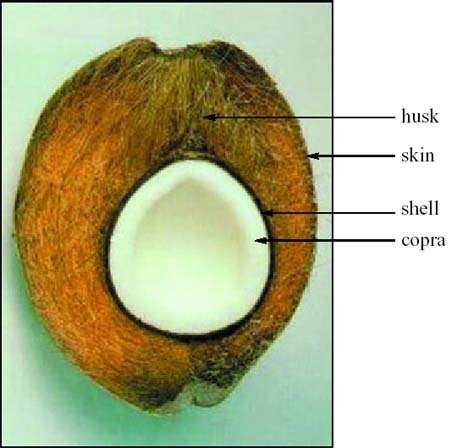 The kernel (copra, coco-water and shell) comprises 65 per cent of total weight, while the husk contributes 35 per cent. Besides the valuable contents of the nuts, the palm yields husks, shells, leaves and the stem which are used domestically as raw materials for many products from fuel to building materials. Coir fibres are extracted from the husks surrounding the coconut (Figure 1). In most areas coir is a by-product of copra production, and the husks are left on the fields as a mulch or used as fertilizer because of high potash content. India and Sri Lanka are the main countries where coir is extracted by traditional methods for the commercial production of a variety of products, including brushes and brooms, ropes and yarns for nets and bags and mats, and padding for mattresses. However, world wide only a small part of the fibres available are currently used for these purposes (Table 2). The average fibre yield is dependent on geographical area and the variety of the coconut tree. In the south of India and Sri Lanka, for example, where the best quality fibres are produced the average yield is 80-90 g fibre per husk. Caribbean husks, by contrast, are relatively thick and may yield up to 150 g of fibre. Coir has faced a declining market for traditional products in recent decades. Despite their comparatively low trade value, the fibres provide significant economic support to populations in specific areas of the producing countries (for example, in the southern Indian states of Kerala, Karnataka, Tamil Nadu and Andhra Pradesh, and in west and south Sri Lanka). Women in these areas are particularly dependent on coir production for their livelihood. Traditionally, coir has been processed into a range of products such as yarns for the production of floor coverings, mats and matting, cordage and nets, bristle fibres for brooms and brushes, and for use with domestic mattress and upholstery industries. These markets have been dwindling in recent years due to strong competition from synthetic products. However, there is a firm trend in the industrial countries towards the production and use of more environmentally benign products and systems, which may help to mitigate the adverse ecological affects of current production methods. The effects of chemical industries, atmospheric degradation, global warming, fast-declining natural resource base, deforestation, waste production, pollution and similar global issues have increased the demand for environmentally benign products. Renewable raw materials such as plant fibres and products, therefore, may have good market perspectives if they can be produced at an economically competitive price and on a scale where quality and supply can be guaranteed3 Currently, expanding export markets for coir can be seen in the demand for erosion control mats and other geotextile applications for civil engineering, or in the demand from the automotive and mattress industries for rubberised coir pads4. Cost effective and environmentally safe technologies have been investigated for drying, bleaching, softening and dyeing of fibre and yarn, and for fast printing of coir products to encourage increased demand for coir products (fibre, yarn, door mats, matting, runners and carpets). To upgrade coir products to meet the standards required of export markets, efforts must start at village production levels. Marketing of ecologically safe coir products should imply and include, however, the whole production chain from fibre extraction to end product and disposal or re-use when no longer required. It follows that production methods should be safe for the health of the workers involved in the coir industry, without negative effects on production performance. Demand for geotextile products is increasing, but still comprises only two per cent of the total volume of coir exports from India (April-October 1998). A large number of alternative end uses for coir based products may become feasible, for example, for the production of fibre reinforced composite materials, fibreboard and similar building materials (for example, for insulation)5,6. Innovative product development and marketing requires concerted action by a number of different players in the production chain. The close involvement of local governments, combined with investment by private enterprises and the support of public research institutions is required for innovation, manufacturing and sales. As a by-product of coir fibre extraction large quantities of pith are obtained, which have been accumulating at production sites over the years. The extraction of 1 kg of fibre generates more than 2 kg of coir pith. Recently, however, the product has gained commercial interest as a substitute for peat moss in horticultural substrate cultivation. Low susceptibility to biodegradation and a highly porous structure enables coir pith to absorb large volumes of water (more than 50 per cent by weight), which makes it highly suitable in a potting mixture. For horticultural use, the product has to meet specific chemical and biological standards of pH, electrical conductivity and elemental composition7. Repression of sodium and potassium from the cation complex of the coir may be desirable for many sensitive horticultural products. Technical information to describe microbial contamination and product safety is another concern for users. Exports of coir pith from India has increased from less than two per cent of the volume produced in 1997 to almost four per cent in 1998. Coir pith is also supplied from other production areas (e.g. Sri Lanka, the Philippines and Indonesia), and the penetration of coir pith into markets for horticultural and garden substrates is gaining interest8. Coconuts shells, which comprises 12 per cent of the weight of the coconut, could be utilized more efficiently. Commercial production of charcoal from the coconut shell provides for an increasingly important export market for cocos producing areas. Carbonization of one tonne of coconut shells produces of the order 300 kg of charcoal, which can be converted into 120 kg of activated carbon. The combustion of waste gases can be utilized to enhance the efficiency of the processes and to generate power. The market for activated carbon in filter materials, absorbents and similar uses could be increased substantially if controlled processing and product certification were available. An alternative domestic application for charcoal could be as fuel for cooking or for drying agricultural products (for example, copra and/or coir).